We are Bad Cloud Games, a two man team (Zack Ewing and Filipe Romancini) that launched our first game Cliffy Run for iOS and Android today! Cliffy Run is an endless runner with intense obstacles, and dozens of characters with their own unique environments for mobile devices. The objective is simple; run as far as you can, and try not to fall, get squished, or drown in the process. But don’t worry, good things happen too! As you play, you are awarded gems scattered throughout the game world, and through a free slot machine that drops gems like candy once every few hours. Gems can be redeemed at the claw machine in a skill based mini game that unlocks new characters. When we first started working on the project, we had nothing to go on other than a few prototypes that Filipe (the code guy) whipped up in Unity, and the conviction that whatever we made, it would be a game that could be experienced completely without ever spending money. We are really excited to share our final result, which is true to our core philosophies of accessibility and fun, fast replay value. Bad Cloud officially started 6 months ago. However, Filipe and I have known each other for a couple years now. 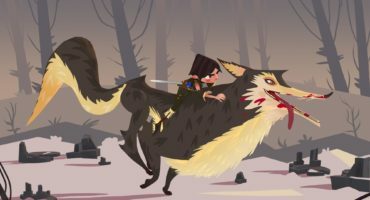 I remember when we met for the first time, I walked into the small game studio where Filipe was working with my portfolio of game art looking for a job in gaming. I wasn’t a good fit , but Filipe and I stayed in touch. We collaborated remotely, I sent him art and he sent back feedback with ideas. We finally hit that perfect timing in our respective jobs to start a project together and today we are excited to launch our first title. We both resonate with the low poly style and wanted to create a game that would play well even on older hardware. So we were naturally drawn to a simple and clean aesthetic. We used Blender for all of our modeling, and imported to Unity where Filipe brought it all together as an endless procedurally generated experience. As an artist, working in such a simple format meant we could very rapidly iterate and change any visual element of the game. Since we exclusively used materials without textures, characters could take as little as an hour to get into the game ready with full animations. Sketchfab has really been an awesome tool for sharing more deeply with our community. Cliffy Run uses very low poly count models, and no textures at all. The flat shading we use in the game only begins to come alive when our characters and the environment are in motion. With flat images, it doesn’t convey the sense of dimension you’d experience with 3D. Sketchfab has made it very easy to upload, and embed an interactive 3D model. This creates a richer user experience that you just don’t get with a gif with only a tiny bit more effort. Which we love! If you have any questions or you’re interested in finding out more, check us out on Facebook.